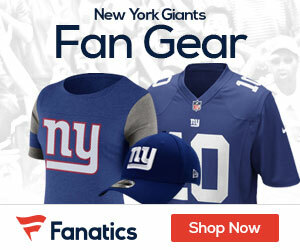 « Giants Sign OT Joel Reinders and TE Larry Donnell. A gifted athlete for his size, Winn possesses a thick looking lower half, natural base strength and a compact upper body. He does a nice job extending his arms into contact off the snap and maximizes his length, allowing him to play longer than he really is. He exhibits an explosive first step off the snap, is a natural bender who coils up well and keeps his base/pad level down into contact. He delivers a strong initial jolt into contact and when he extends his arms, he can disengage and make plays off his frame. However, vs. bigger, more explosive lineman he can initially be overwhelmed vs. an in-line run game. He is a good enough athlete to slip through contact and get himself back into the play, but will have some trouble trying to fight off blocks inside vs. NFL caliber blockers. Winn is at his best threatening gaps inside off the snap and trying to make his way into the backfield. He plays low, runs his legs through contact and uses a strong club in order to fight his way through contact. He exhibits the first step to cross the face of defenders, and for the most part stays low and works his way through contact. He isn’t a dynamic pass rusher at this stage, but again his explosive first step and ability to keep his pad level down gives him the ability to routinely threaten gaps inside. In space, Winn will use the club to shed and has the initial burst to slip and close on the football. However, he is a bit of a linear pass rusher inside who doesn’t have the kind of lateral quickness to make blockers miss. He likes to fire off the ball low, pressure gaps and use his pad level to slip under contact and accelerate. He is a solid tackler who breaks down well in the backfield for the most part and displays solid instincts when trying to find the football. Impression: Winn is a bit of a tweener who will get looks as a 43 DE, a 34 DE and a 43 one gapping DT. I think he’s best suited to play 34 DE as he has the power to anchor on the edge and offers some pass rush ability as well. Either way, the guy looks like a starting caliber defensive lineman in any number of schemes. Strengths: Good size, length, and bulk – Very versatile, has played 3-4 DE and 4-3 DT/DE for BSU, even stands as an OLB/ILB at times – Sees the ball very well – Can penetrate or hold off blockers – Strong initial punch, great bull-rush – Violent hands – Very productive when on the field. Boise State Broncos defensive end Billy Winn should be one of the top prospects out of the Mountain West conference this year. Boise has been putting some athletes in the NFL in 2011 with receivers Titus Young and Austin Pettis and now they’ll prove the Broncos can play some defense as well. Winn looks to be a versatile defensive end prospect who can play anywhere except nose tackle. He’s a very good three-technique with more than enough athleticism to seal the edge or rush that inside shoulder of the opposing guard. His quickness and burst at the snap can be very disruptive on run plays. This short range quickness allows him to get in the backfield on occasion. With some adjustments, he could prove to be an effective nose tackle, but he is undersized for that position. While Winn is very strong in his lower half, he just doesn’t have that elite upper body strength necessary to handle double teams on a regular basis. Outside of that, he does his best when he can initiate contact with his hands before the blocker can. When bull-rushing, he has to be able to stay inside his frame and drive through his body since he sometimes gets caught reaching and pushed out of the play. 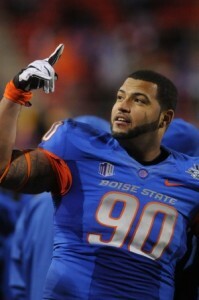 With a prospect like Winn, the pros outweigh the cons and he projects to be a second round pick in the 2012 NFL Draft. Billy Winn is an athletic defensive tackle prospect. Versatile, can play all along the line and has experience standing up. Good burst. Stays low. Good use of hands. He needs to bulk up a bit and can work on his pass rush moves. He’s very quick and that helps him against the run. A very solid prospect. Love his versatility. Reminds me a bit of Kiwanuka in that you can play him all over. He needs to improve his strength but Winn is the type of prospect who can play right away and make an impact as a rotational lineman who will play most of his snaps at 3 technique. On passing downs, could see him standing up and rushing, or playing DE or rushing from the inside. I think he’s a 3rd round pick. Teams will be sacred of his lack of strength and the relative marginal competition (of course, Boise does play some big games, but for the most part, not really). The Giants have a need for D-Line depth, particularly in the middle and Winn fits that need.